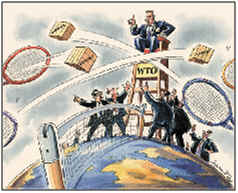 ← Trump and New WTO Litigation, Finally. Here’s a quick review of WTO litigation concerning the U.S. (as either a complainant or respondent) during Trump’s presidency so far. The U.S. has been the respondent in 12 cases and the complainant in only 3 cases. Countries that brought actions against the U.S. have been India (1), Korea (3), China (2), Vietnam (2), Canada (3) and Turkey (1). Cases against the U.S. have involved §232 duties on steel and aluminum, §201 duties on washers and solar panels, §301 measures concerning intellectual property rights, among others. The Trump administration has brought only three cases in the WTO. One case has been brought against each China, India, and Canada. They have involved intellectual property rights, among others. What can be said so far at this point? The U.S. is defending all the cases brought against it during the short Trump administration and has only belated filed a major case against China (in which China has responded by its own case). So despite the U.S. pronounced opposition to the WTO and its dispute resolution system the U.S. continues to use it. Becoming more active recently in defending cases and bringing them. That’s good — at least for now.